Event Cinema: Stratford Festival in HD: "Coriolanus"
Robert Lepage’s high-tech update of Shakespeare’s political tour de force made its US Premiere at the Hop. And now it is back on the big screen! Live in HD. A great warrior-turned-politician is despised by his people. And the feeling is mutual. The Stratford Festival’s landmark production reveals the age-old tensions that tear at the heart of democracy—a theme that engaged the entire Dartmouth campus this past fall when the Hopkins Center hosted the US Premiere. 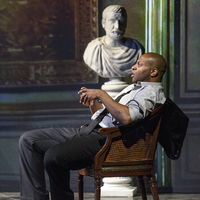 Director Robert Lepage’s signature cinematic storytelling frames superb acting by a veteran Stratford cast, led by André Sills in the title role. A mesmerizing critique of leadership and our media-obsessed present, this high-tech update of Shakespeare’s political tour-de-force now makes its US Premiere on the big screen!